As a follow-up to the bulletin this morning announcing the Tentative Agreement (TA), copies of the TA are immediately available online on the District Lodge 142 website at www.iamdl142.org. Hard copies of the TA are being printed and should be shipped by Friday to each Maintenance Base. They will be available either through a Negotiating Committee Member or a Shop Steward so check locally to find out who will be handling the copies of the TA at your Base. Per the District Lodge 142 By-Laws, it is a requirement that every member receive a copy and have it in their possession for a minimum of five (5) days prior to the scheduling of a vote. Once you receive your copy, we ask that you please sign the roster acknowledging receipt. We have tentatively scheduled the explanation meeting and ratification vote for all locations and shifts to occur starting on November 27 and going throughout that week. Once additional details of the vote are confirmed, they will be released via a bulletin. As a reminder, there is no absentee ballot provision for a contract ratification vote. You must be present at the meeting at your Maintenance Base to vote. 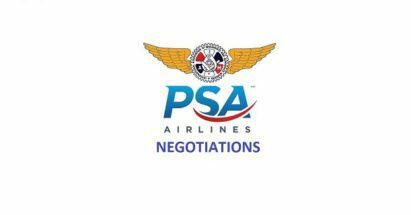 Breaking News: IAM/PSA Airlines Tentative Agreement Reached!